The word Rhinoceros is used to describe any one of the five extant species and several extinct species of the members of the family Rhinocerotidae. The name is often abbreviated to just Rhino. The word itself comes from the Greek rhinoceros, which translates to mean ‘nose-horned,’ rhinos (nose) and kerato/keras (horn). Location: East & southern Africa, India, Nepal, Malaysia & Indonesia. Predators: Crocodiles, big cats & hyenas can prey on baby rhino. Adults, don’t generally have predators. 3 Species Critically Endangered – Javan, Sumatran & Black rhino. The five species of rhinos that still exist on the planet include the White Rhinoceros, Black Rhinoceros, Indian Rhinoceros, Javan Rhinoceros and Sumatran Rhinoceros. Rhinos are some of the largest remaining megafauna with all species known to weight one ton or more. Oddly enough, although they have such a massive presence, the rhino brain is quite small for a mammal of its size. The rhino brain is 400 to 600-grams. Their diet is described as herbivorous which means leafy greens for the most part. As the rhino has a stomach that permits fermenting of food, they can eat more fibrous material when required. 1. The White Rhinoceros is the most abundant rhino subspecies in the world. There happen to be two subspecies of this rhino – the Southern White and the Northern White and the Southern species had a recorded population in 2013 of well over 20,000. On the other hand, the Northern White is considered critically endangered with just two captive females known to exist. 2. The White Rhino is not white at all. The name for this species is believed to have come from either the Afrikaans word ‘wyd’ or the Dutch word ‘wijd’ which actually means ‘wide’ and describes the appearance of wide, square lips of this species. The White Rhino has a huge body, large head with a short neck and a broad (wide) chest. The coloring ranges from slate grey to a yellowish brown. 3. The White Rhino male is slightly larger than the female. A male White Rhino will weigh around 5,000 pounds. The female will weigh about 4,000 pounds. 4. There are four subspecies of the Black Rhino. Although the name of the Black Rhino is confusing as it is not black, the name was chosen to distinguish it from the White Rhino. The subspecies include the South-Central Rhino, the South-Western Rhino, the East African Rhino and the West African Rhino. The subspecies names relate to the geographic regions these Black Rhinos can be found. 5. The Black Rhino is smaller than the White Rhino. An adult Black Rhino can weigh between 1,870 and 3,500 pounds. The females are smaller than that. The Black Rhino uses its pointed mouth to grab leaves, twigs and other vegetation when feeding. The White Rhino also has no teeth and pulls food from branches with its mouth in much the same way the Black Rhino does. 6. The Indian Rhino is almost as big as the White Rhino. The Indian Rhino, also known as the Greater One-Horned Rhinoceros, has a single horn, where the White and Black species have two of varying lengths. The Indian Rhino weighs between 5,500 and 7,000-pounds with the female just slightly smaller in size. The Indian Rhino exists mostly now in protected areas in India and Nepal. 7. One species of Rhino is one of the most endangered large mammals in the world. The Javan Rhinoceros is not only down to few in numbers – estimates in 2015 had about 60 in Java and Indonesia. At one time they were widespread throughout Asia however, they were nearly hunted to extinction in the 1930s for their horns. Legend has it that the horn of the Javan Rhino had medical powers as did the blood of the mammal. Apparently, in 2015, there were only about 60 remaining and they are residing in a protected national park. 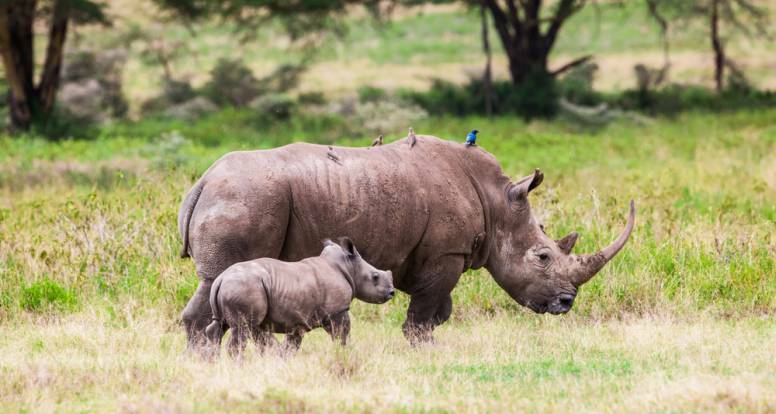 The last time one of these Rhinos was killed for its horn was in 2011. 8. Little is known about the Javan Rhino. It is quite honestly the lesser known of the Rhino species. It has a single horn, like the Indian Rhino, and is one of the smallest species of Rhino weighing between 900 and 2,000-kilograms. The male horn can grow to 26-centimetres in length and females either do not have a horn or they have just a stubby knob in its place. 9. The Sumatran Rhino is the smallest of the species. The adult Sumatran Rhino can weigh between 1,500 and 2,200-pounds. They stand roughly just over 4-feet tall and range in length between 8 and 11-feet. They have two horns of different lengths and have the most hair of all Rhino species. They are reddish in color and the body is short with stubby legs. As a result of habitat loss and poaching, the numbers of this Rhino have dropped considerably. There are estimates of about 300 remaining. There are three subspecies of the Sumatran Rhino including the Sumatran Rhinoceros Proper, the Bornean Rhinoceros and the possibly extinct Northern Sumatran Rhinoceros. It is possibly extinct as no living specimens have been located in recent years. 10. Each of the different species of Rhino has a different kind of skin. The White Rhino has some hair but it is mostly found on the tips of its ears and as tail bristles. The rest of the hair is sparse throughout its body. The Black Rhino has much the same amount of hair but has a larger front horn (up to 140-centimetres in length) and sometimes has a third horn. The Indian Rhino has thick skin in a silver-brown color that folds into the shoulder, back and rump which resembles body armor. The shoulders and upper legs are covered in warts and there is very little body hair. The Javan Rhino has a hairless, grayish skin that falls into folds on the shoulders, back and rump giving it an armored appearance much like the Indian Rhino. The Sumatran Rhino is the hairiest of the species and probably has this sometimes thick coat of hair due to the fact that it lives in higher elevation territory than any of the other rhino species.